Avril, the now-former Seahawk, has turned into a mentor for a player the team is hoping can help replace him. For two weeks this summer, class was in session early each morning at the Athletic Form gym on 6th Avenue South in Seattle. The teacher? Cliff Avril, a now-former Seahawk and budding talk-show host on KJR-AM 950. The student? 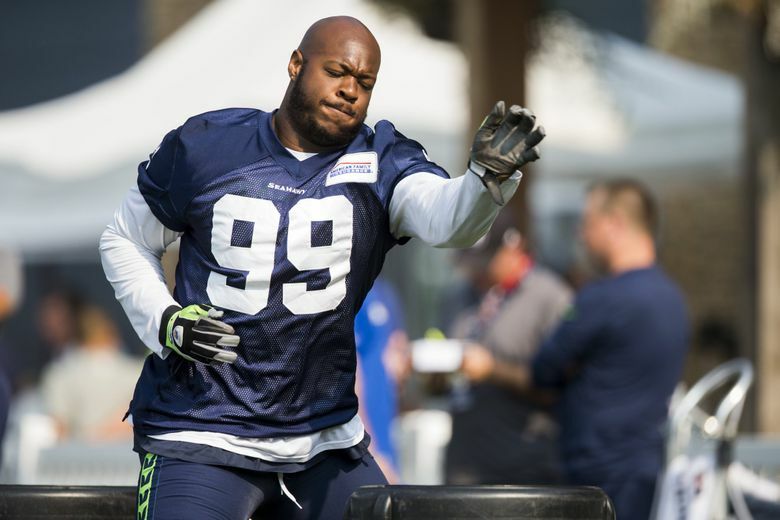 Quinton Jefferson, a 2016 fifth-round draft pick, and one of the players the Seahawks are counting on to replace Avril and Michael Bennett, who from 2013-17 formed the core of the team’s defensive line. Or maybe instead of teacher-student, it’s really more, as Avril put it, “a big-brother, little-brother type of feel.’’ Avril says he’s always reached out to young players to let them know he’s available for any advice and guidance they want, and he also worked out this summer with Frank Clark. But Jefferson, who played at Maryland, and Avril have become particularly close. “Just always have been — me, him and Mike,’’ Jefferson said. Earlier this week, after being told that coach Pete Carroll said if the season started today Jefferson would have a prominent role in the team’s defensive line rotation, Jefferson quickly pointed to Avril’s tutelage as a significant reason for his strong training camp. The two not only worked out at Athletic Form with Jefferson’s trainer, Robel Woldu, where they practiced pass-rush moves, but also regularly watched film. And once camp began, Avril — who, on most days watched practice from his new radio show perch on-air from 10 a.m. to 1 p.m. — could also offer daily reminders. One of Avril’s main pieces of advice to Jefferson was to simplify his pass-rush arsenal. Scissors, Avril says, using hand motions to demonstrate, is basically what it sounds like — moving your hands in quick crossing motions “to knock their hands down before they (offensive linemen) punch you,’’ he says. The cross-chop is essentially just a strong, downward chop of the arm aimed at an offensive lineman’s forearm to knock them off balance. “He’s gotten really good at just being able to time out punches,’’ Avril said. Jefferson, 25, has also played strong run defense in camp while filling primarily a role that is similar to that of Bennett — defensive end in the base defense and moving inside to tackle in the nickel. He had two tackles in Thursday’s preseason opener against the Colts. The role he appears ticketed for is what the team envisioned when they made the rare decision — for the Seahawks, anyway — of moving up in the draft to take him, trading a fourth-round pick in 2017 to the Patriots in the process. But injuries, specifically a knee issue that required surgery, held Jefferson to just three games as a rookie in 2016. He said he was still not quite 100 percent during training camp a year ago when he ended up being released by the Seahawks in the cutdown to 53. Signed by the Rams, he was released there quickly when Aaron Donald finally reported. Jefferson eventually landed back in Seattle to replace Avril when Avril suffered what turned out to be a career-ending injury against the Colts. But injuries again — this time a broken hand — held him to just six games. He says he’s now healthy, the knee and hand no longer issues, which, along with Avril’s tutelage and an improved understanding of the league, has the Seahawks thinking he could be on the verge of a breakout season. Avril says helping Jefferson is no different than what he has always offered younger players, having felt it the veterans’ job to guide those less experienced. But in Avril’s first summer not preparing for a football season in his adult life — barely more than a year removed from what was the best season of his NFL career when he made the Pro Bowl for the first time following the 2016 season — staying close to the game any way he can is undoubtedly easing the transition into retirement. For Jefferson, the situation creates what can appear a somewhat weird circle of life: being groomed to replace those who have and will continue to groom him.